The means for creating (and maintaining) a documentation site — or a style guide, or a knowledge base, or any other set of information frequently used as a reference — have shifted back and forth over time. Blogging software! Wikis! Flat files! Database-driven! Google Docs! GitHub Pages! Dropbox Paper! Notion! The number of options — and the degree to which their selection sometimes come down to one person’s aesthetic choice or workflow preference — has left the job of keeping updated documentation a bit of a mess. The New York Times is no different. Several years ago, it was common for each desk to have an internal wiki that they used to collect these instructions. As the use of Google Docs grew within the newsroom, the wikis began to be used and maintained less frequently, and knowledge of existing documentation became scarce. When the older wikis were shut down in 2017, several teams that often collaborate realized we no longer had an effective strategy for sharing documents across the newsroom. We realized we could do better, and decided to build a centralized tool, called Library, that would host our documents in a way that could be shared across the newsroom. When you connect Library to a shared folder or team drive, it will traverse the documents in the folders and create your site content. Documents in Library are searchable, taggable, and can be grouped by desks or categories. To add a page to Library, you simply create a new Google Doc, or move an existing document into the folder or team drive that powers Library. Existing pages feature a convenient link that enables quick access to the Google Docs interface for any particular document, and editing the Google Doc makes changes to the page in Library. 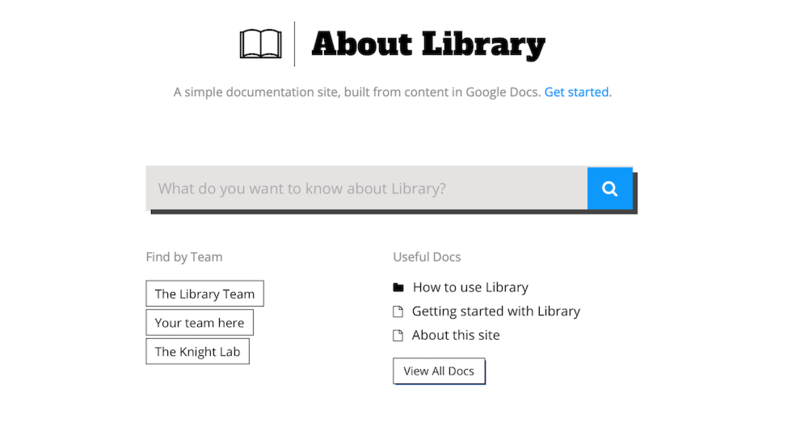 Library is Google docs and Node dressed up like a wiki. Benton, Joshua. "The New York Times has released an open-source tool to let you manage all your internal knowledge more easily." Nieman Journalism Lab. Nieman Foundation for Journalism at Harvard, 20 Mar. 2019. Web. 23 Apr. 2019. Benton, Joshua. "The New York Times has released an open-source tool to let you manage all your internal knowledge more easily." Nieman Journalism Lab. Last modified March 20, 2019. Accessed April 23, 2019. https://www.niemanlab.org/2019/03/the-new-york-times-has-released-an-open-source-tool-to-let-you-manage-all-your-internal-knowledge-more-easily/.